reating a slideshow from your digital photos has never been easier. 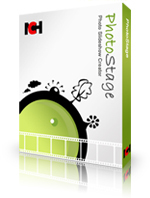 Photostage brings your pictures, images and video to life and lets you share your favorite memories with family and friends in an interesting and portable way. * The brief was simple - make a slideshow creation program that is so easy to use your Grandma could do it. The result - Photostage. * Cool panning and zooming effects brings your photos to life. * Burn your slideshow to DVD for playback on TV, or as a standalone video file for enjoying on web and portable devices. * Touch up or enhance your photos and videos with ease.